This program floodfills a surface mesh (which must be very nearly watertight) to produce a voxel array, optionally computing a distance field in the process (the distance from each voxel to the surface and the corresponding closest surface point). The program can also compute shortest distances for each voxel to a series of additional meshes (up to 5). It can load models in 3ds, obj, and ply formats, and the .node/.face format used by TetGen. The output format is a ".voxels" file, which is a binary format described in voxel_file_format.h . The program can also output tetrahedral meshes in TetGen format; the floodfilling process is identical to that used for voxelization, and each voxel is simply split into five tets (so the mesh is not conformal). 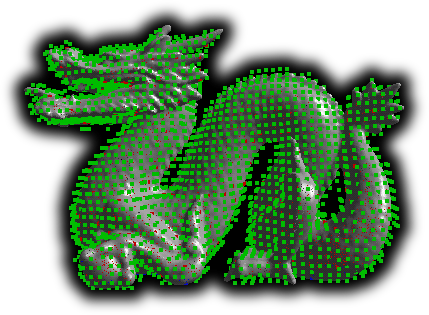 Voxelization can be initiated interactively or from an .ini file. A Matlab script is included to read the resulting files into Matlab. The application was developed in C++ and is based on CHAI and WinMeshView. 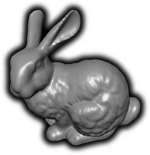 Thomas Schweich has written Python Interface for Voxelizer. When voxelizer starts up, you'll see the GUI pictured at the right. 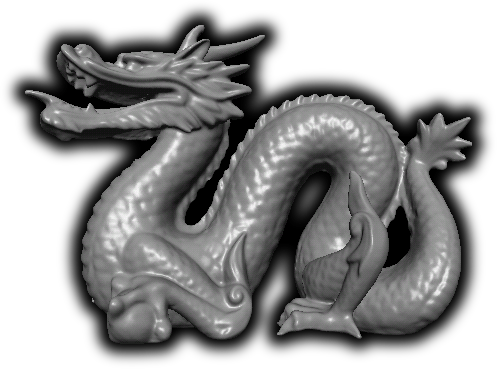 To voxelize a model, click "load model" and choose the model you want to voxelize. Before voxelizing an object, you may want to click "test voxelization" just to confirm that the floodfill is successful and that the mesh is watertight (if it's not, the whole bounding box of the mesh will get filled). When you're ready to voxelize, just click "voxelize". If the object is "hello.obj", you'll get a file called "hello.v[nn].voxels", where "nn" indicates the resolution of voxelization (see below). You can change the resolution of voxelization (or tetrahedralization) in the "voxel resolution" box. This is the number of voxels along the longest axis of the bounding box of your object. Larger voxels produce a coarser mesh and also may lead to problems getting through "tight spots" in your mesh. Voxels are isotropic, so the long-axis resolution determines the resolution on the other two axes. Sometimes the seed voxel for the floodfilling is a bad choice. You can change the seed (where the flood-fill begins) by clicking any triangle in the mesh. You can load "subtractor" and "modifier" models _after_ you load the model you want to voxelize. A "subtractor" model is used to put "holes" in your voxelized object; it blocks off space that should be considered _outside_ the object. A "modifier" model is used for distance-field computation; every voxel is output along with its shortest distance to each of the modifiers. Use the "compute distance field" check to determine whether the program computes a distance field when it computes a voxel array. This takes about 10 times longer than flood-filling alone, so if you just want a voxel array, you should leave this un-checked. the mesh to load at startup. only one meshes will be processed; if more than one OBJECT_TO_VOXELIZE entry is present, all but the last will be ignored. If this is 0, the program will load the specified model and start the GUI. If this is 1, the program will immediately voxelize the specified model and quit. Four sample models are included. They don't all voxelize well with the default seed; load them using the provided .ini file (which contains commented-out entries with seeds for each model), or click somewhere near the core of the model before voxelizing. 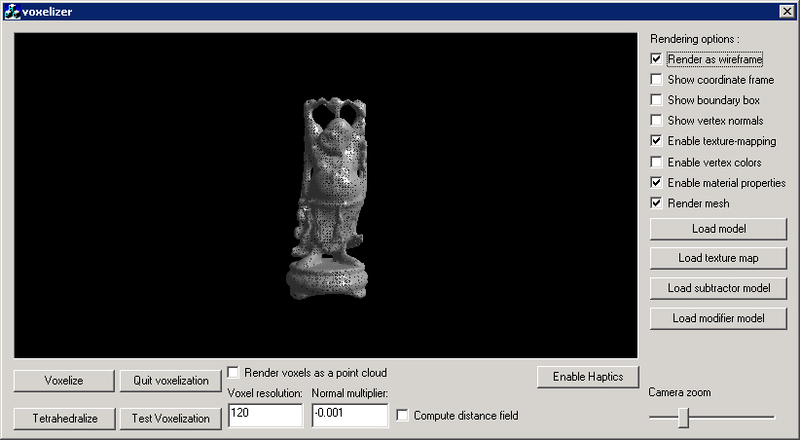 Models were obtained from the Stanford 3D Scanning Repository, except for the gear, which came from the INRIA mesh repository. The most recent version of the code and all build dependencies is on github. This zipfile contains the voxelizer sources and binaries plus required dll's, sample models, the default .ini file, and this .html file. Also includes this Matlab script to read the voxelizer program's output files into Matlab. This version was last updated in 2013. Morris D. Morris, D., & Salisbury, K. (2008). Automatic preparation, calibration, and simulation of deformable objects. Computer Methods In Biomechanics And Biomedical Engineering, 11(3), 263-279. Morris D. Algorithms and Data Structures for Haptic Rendering: Curve Constraints, Distance Maps, and Data Logging. Stanford University Department of Computer Science Technical Report 2006-06.